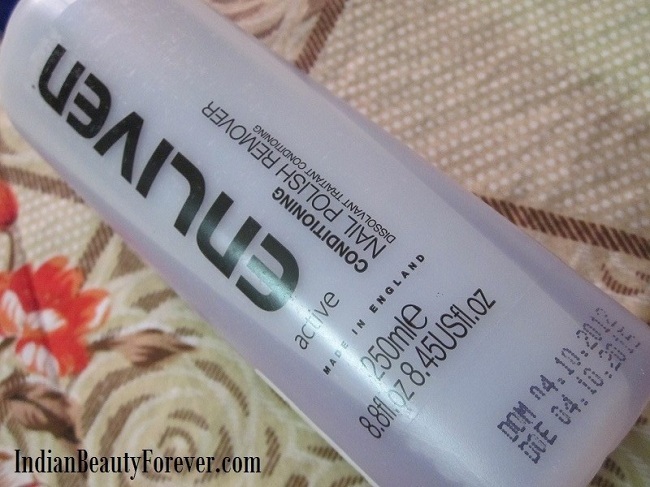 Okay, so this is the second review on the same day and as I reviewed Maybelline color show nail polish in the afternoon, I thought I should also share a quick review on this Enliven Conditioning nail polish remover, I got it long ago but review kept on getting delayed so, here it is now. 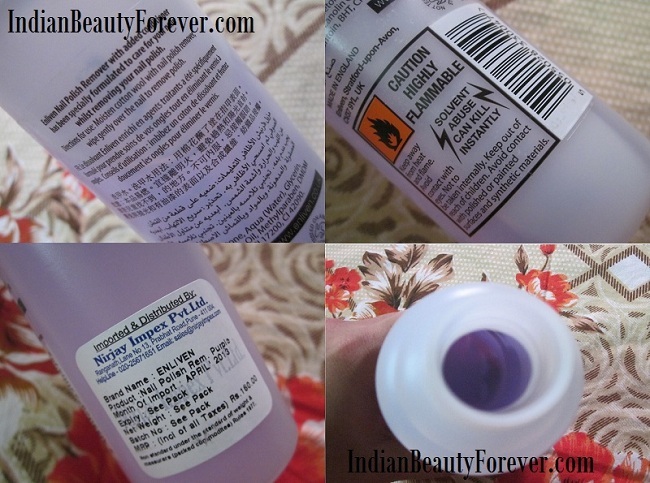 It comes in this big bottle that can you can see in the pictures and the nail polish remover is a light blue colored liquid which doesn’t have too strong smell and is as effective as any other removing product is. But the best thing is that it will not make my nails or the skin around dry. Therefore it is aptly called as conditioning as it certainly conditions while you get rid of your old paint from your nails. So far, I have used a couple of enliven products and they have not failed to impress me or I should say they haven’t disappointed me. I take a cotton pad or ball and then I take some of this liquid on it. After that lightly place the cotton pad on my nail from which I wish to get rid of the old, chipping or even freshly applied nail polish, if in case I am doing the swatches! I apply a color, click pictures and then will remove it and move on to with the other shade. Anyways! Keep the pad on the nail for 30 seconds and then rub off over the paint. It will be easily removed. Keeping the pad for sometime actually dissolves the paint and loosen it so it will get away easily!. The only problem that I find with this is its big mouth without a stopper or something like that. whenever, I am using it, I always end up taking more than the required quantity and also if it falls the entire liquid will be wasted. To tackle this problem,I have put it in a smaller bottle which I fill every time it finishes! yaay!! 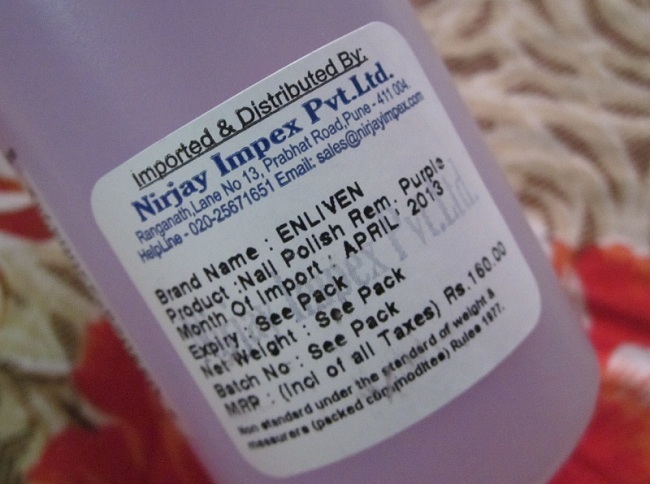 I will highly recommend this nail paint remover as it is in budget and also, the quantity that you are getting it huge for the price. It removes your polish without making the nails or skin dry! hehe. :) Sure, It is really good, i like it.do try it! Going to get this one, Thanks for the review. I like this product! Do give it a shot!